We kicked off November with an intimate roundtable as part of our Dealing with Unknown Unknowns breakfast series on the topic of Robotic Process Automation (RPA). Led by Guy Kirkwood, Chief Evangelist of leading global RPA vendor, UiPath, and Erevena Senior Partner, Kelvin Jones, we explored the impact of RPA on regulatory processes with leading European venture investors, disruptive technology founders, and industry executives. Topics of discussion included Know Your Customer (KYC), Anti-Money Laundering (AML) processes, and the upcoming General Data Protection Regulation (GDPR). These regulations impact how every business deals with its data; we looked at how the budding RPA industry can assist companies to meet these requirements by the 25 May 2018 deadline. The RPA market is currently dominated by three leading vendors - Automation Anywhere, Blue Prism, and UiPath - each offering a complete solution to suit particular RPA requirements. As the early pioneers of the market, Blue Prism have led the way with their robotic solution and development of a strong partner network. Their IPO in March 2016 and subsequent stock market performance has demonstrated the market confidence in RPA: the stock has grown by over 600% since the flotation. Automation Anywhere lead the market in revenue, partly due to carrying out their own implementations, sometimes in competition with large system integrators (SIs). UiPath’s differentiation comes primarily from their product development, focused on building cognitive RPA solutions, which allows for broader process automation, with greater data complexity. 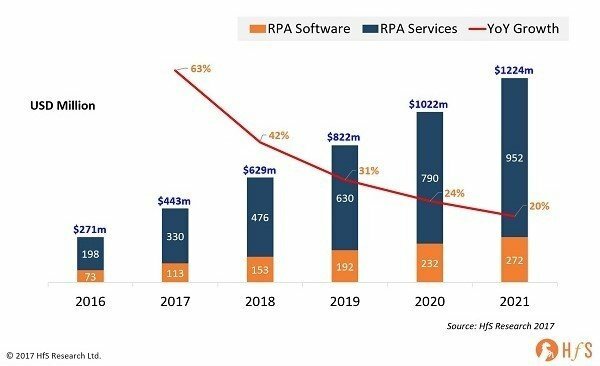 All have experienced enormous growth over the past two years as the global market for RPA software and services has exploded, with forecasts expecting the market to be worth $440m globally by the end of this year, up from $271m in 2016. There are limits to how RPA deals with unstructured data. It is estimated that 90% of the world’s data has been created in the past two years, 80% of which is unstructured. RPA solutions are increasingly evolving to deal with this need. The market is also developing more front-end RPA solutions to complement the existing roster of back-end solutions. The back-office processes were the first, and most obvious, targets for automation, involving highly-process-driven, often very repetitive manual tasks. The automation of these processes releases employees from such mundane tasks, allowing greater focus on higher-value activities. A front-end automation solution works on a one-to-one basis (one robot to one person) allowing the employee to focus more on interacting with customers, hugely increasing customer experience. Over the past 18 months, large professional services organisations have benefited from developing partnerships with industry leaders in this space – UiPath, for example, has strategic partnerships in place with many of the global SIs and a new breed of ‘pure-play’ RPA Services providers such as Symphony Ventures. These industry-leading organisations are able to assist in providing the answers and a roadmap in the advising and execution of digital transformation in client’s business, as well as their own. RPA is a concrete first step in this digital transformation. The growing interest from SIs is also a clear indication of a market which is being driven from the bottom-up, with demand driving substantial innovation in the space. The exponential growth of the market and timely and substantial ROI for adopters are also clear benefits for SIs – revenues from implementing RPA are many times greater than those from licensing. The RPA market’s growth is occurring in tandem with the transformation of traditional Business Process Outsourcing (BPO). With changes in the traditional economies of outsourcing markets making them less attractive options than they once were for many businesses, many are bringing processes back in-house or are looking at alternative options - including RPA. Automation provides time and cost-efficient solutions more resilient to ongoing changes in the labour arbitrage market. The focus has moved to looking at smaller, faster, and more agile ways of managing these processes. Even the terminology around BPO is changing, as the traditional language, and even possibly the term ‘BPO’ itself, is associated with a now increasingly outdated way of managing business process. There is a growing recognition from the leading consultancies and SIs that managing business processes now can, and has to, be done in a much more efficient way. The idea that ‘offshoring is dead’ is one which has been being debated since the start of the year – and yet, this slightly tongue-in-cheek quip is substantiated by the early response of the traditional outsourcing economies to the advance of RPA: UiPath offer free online robotics training in their Academy, and of the nearly 30,000 people who have so far enrolled, 60% of are in India. This is a small but indicative trend, as many within a country which has been one of the stalwarts of traditional outsourcing practices look to adapt, and not be left behind by the new world of automation. GDPR readiness is coming at a time when many are questioning their traditional approach to managing business processes, and when many are also looking to the burgeoning RPA market for innovative solutions. RPA offers industry-specific solutions, on a trans-industry platform, making it attractive to any business likely to be affected by these, and other, regulations. Prior to RPA, those under regulatory supervision were required to either implement massive Master Data programs, which are both costly and time-consuming, or to ‘throw bodies’ at the problem. Neither solution is cheap nor fool-proof. Aside from the other efficiencies which can be made with RPA, a useful by-product is also that it stores all required information in one place, making proving regulatory compliance much more straightforward. It also removes the risk of human error – all tasks are done with complete consistency. Therefore, an RPA solution, when implemented correctly, can offer GDPR, or any other regulatory process, ‘in a box’, with little chance of error, or inconsistency. This is nothing short of miraculous for any business which has ever faced the scrutiny of a regulator. However, there are some barriers related to RPA implementation and regulatory compliance. Some of the more advanced forms of cognitive RPA aren’t allowed by regulators, as machine learning capabilities answers change as the data sets expand. There is also the issue of poorly-implemented RPA, which is generally the result of poor process definition at the start of any RPA journey. A good RPA implementation will involve consultation with subject matter experts, rather than solely process experts, on the process to be automated, so that unnecessary or long-winded steps involved can be streamlined. RPA can automate any process put in front of it – but will only ever add value if this process itself is a good one. Other issues with RPA implementation can also come about when ongoing management and maintenance of the system are not factored into the original business case; when RPA is interacting with several other business processes, it needs to be remembered that, should any of those processes change, the RPA needs to be kept up to date with that change, or else risk grinding to a halt. RPA is an operational system, as any other IT system, and continual maintenance ought not be forgotten. The morning concluded with considering the relationship between RPA and other emergent technologies, such as blockchain, being adopted to improve business compliance and regulatory conformity. These currently don’t work together – but ought they to, as part of the digital operations environment? Banking, after all, has been one of the first and fastest industries to implement RPA solutions – is there an opportunity for collaboration? The constrictions on the banks’ abilities to collaborate on infrastructure development due to anti-competition laws is a possible hindrance to this – but in a world where the cost of banking infrastructure is huge, and predominantly passed on to the customers, could a cost-effective, compliant, consistent technological solution, which could sit next to the bank’s own technology, rather than within, be the answer?